In the early 1900s, several large floods plagued Yuma, Arizona and the Imperial Valley destroying agriculture. Following these natural disasters, discussion arose about the possibility of building dams to prevent future floods and to meet the water needs in the west. In 1902, the Newlands Reclamation Act of 1902 was passed, which provided that the construction of dams would be funded by money obtained from western land sales and irrigation water (Topping, 1997). It should be noted that in the early twentieth century, building dams was easy in terms of politics. Representatives pushed for the building of dams because the creation of dams helped meet people's basic needs for power, water, and safety from floods. Dams were not controversial, so representatives used dams as a political tools to further their own support. In 1922, the Colorado River Compact was passed between seven states: the lower basin states including Arizona, Nevada, and California and the upper basin states of Utah, Colorado, Wyoming, and New Mexico. This compact guaranteed 7.5 million acre feet of water annually to the lower basin states. Almost immediately after the compact was agreed upon, the states began damming projects (Topping, 1997). The Compact did not allow any water for Mexico and so it was modified in 1944 in the Mexican Water Treaty to guarantee .73 million acre feet of water per year to Mexico. Thus, the total amount of water that the upper basin was required to transfer to the lower basin states and Mexico was 8.23 million acre feet of water per year. Since the measurements taken in 1944 were of an unusually wet year, in some years the upper basin states have had trouble meeting the requirements (Carothers and Brown, 1991). This has led to disagreements between states and also between the United States and Mexico. The Bureau of Reclamation began planning the Colorado River Storage Project following the compact, and spent the next several years researching several spots for dams. Initially, the Bureau chose Echo Park as the site for the dam. Conservationists strongly objected to this site because part of the area which would be flooded was part of a national park. After winning the battle against the dam in Echo Park, the conservationists did not fight against the decision to dam Glen Canyon until the last minute. Gary Topping wrote, "Glen Canyon was lost through a choice by the Sierra Club and other conservation organizations to put their efforts into saving Echo Park, which they regarded as savable from a similar doom and to ignore (and thus sacrifice) Glen Canyon, which they thought they could not effectively defend... The sacrifice of Glen Canyon in other words was a sin of omission by conservationists rather than a sin of commission by the Bureau of Reclamation." (Topping, 1991). Since the building of the Glen Canyon Dam, the Sierra Club and other conservationist groups have strongly fought against the dam and have argued that Lake Powell should be drained. On April 11, 1956, the Colorado River Storage Project authorized the building of Glen Canyon Dam. Seven years and three hundred million dollars later, a dam 710 feet high was built. 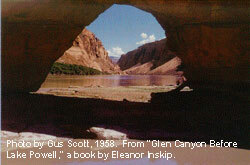 In 1963, the Glen Canyon was closed and Lake Powell, the world's largest lake was created (Webb, 1996).